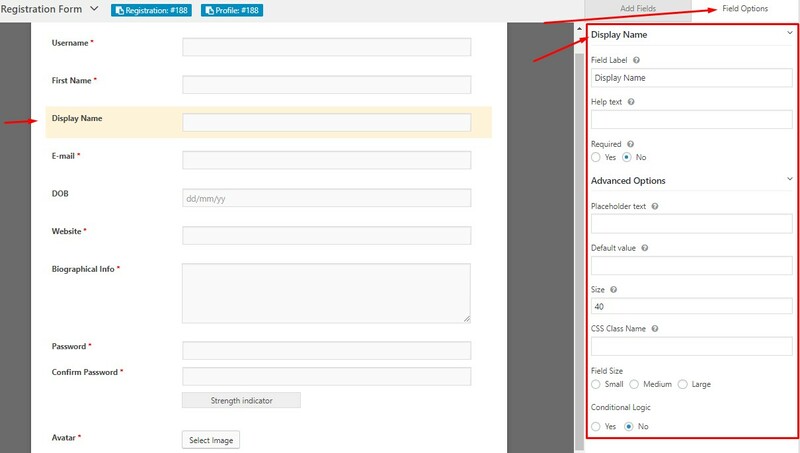 Elements of User Field are the things available for the user to see in the frontend. 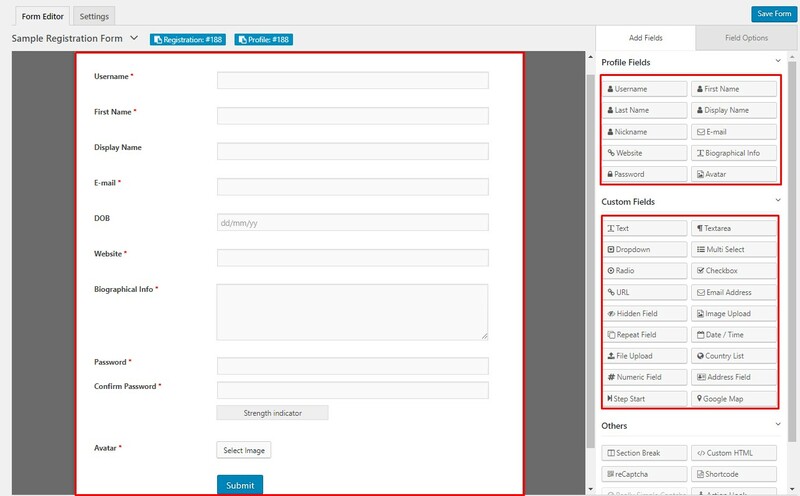 WP-admin→User Frontend→Registration forms→Add forms and then follow the below steps. 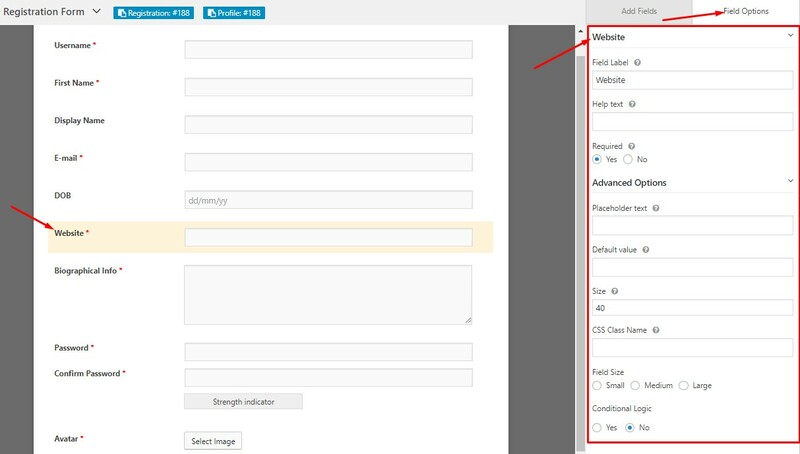 After adding a new form for user, here is a view of the form editor section where you will be able to see and add all the available User Field Elements. 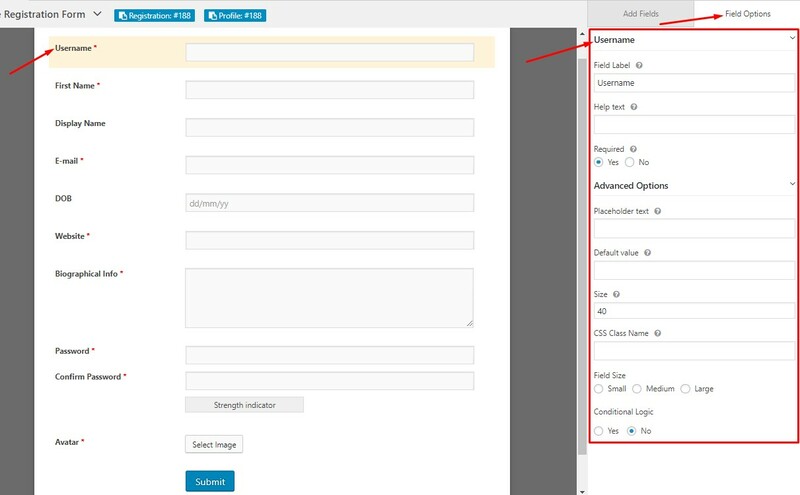 The above image shows a sample custom made registration form created with the available user field elements by adding fields from both Profile Field & Custom Fields section. A brief explanation of the above available User Field Elements and its field options are given below. Username field lets an user to input their username in the form. Field Label: This is the text that you will see on the form of the Username field. You can put any text here that helps to understand the use of this field. 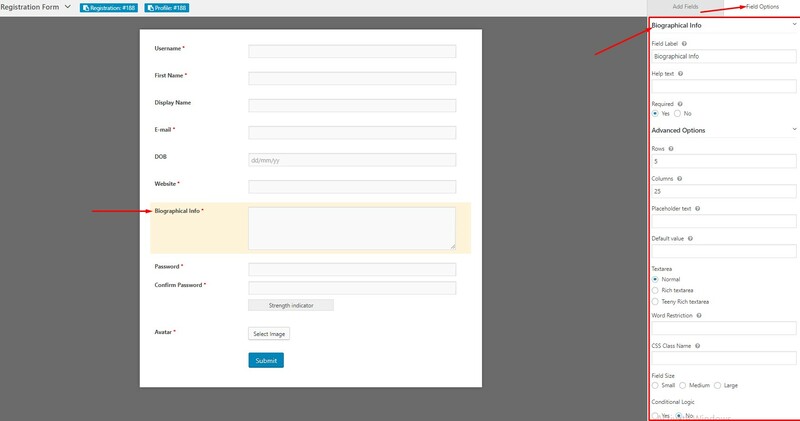 Help Text: You can put a help text for this field to display some specific message or instruction related to that field in order make the form user friendly. Required: This option allows you to make this field either required for submitting the form or optional. Placeholder Text: You can input the text for HTML5 placeholder attributes. Default Value: You can add default value for all the section of Username field. Size: Lets you to limit the size of Username field. CSS Class name: This option helps to include a CSS class for this field. Field Size: Allows you to choose three Field Size: Small, Medium & Large. Conditional Logic: Lets you to set the conditional logic of this field to Yes or No. This field allows an user to input their first name. Field Label: This is the text that you will see on the form of the First Name field. You can put any text here that helps to understand the use of this field. 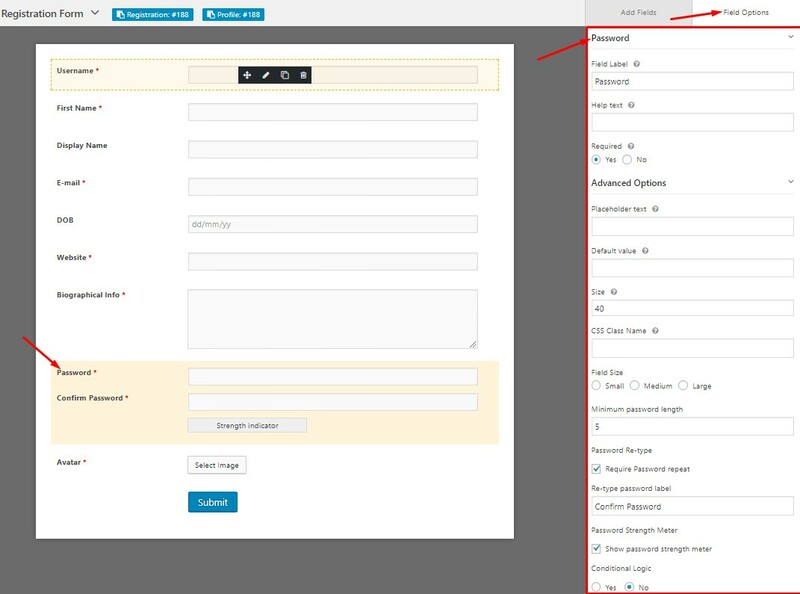 Default Value: You can add default value for all the section of First Name field. Size: Lets you to limit the size of First Name field. This field lets you to input the name that you want to be displayed. Field Label: This is the text that you will see on the form of the Display Name field. You can put any text here that helps to understand the use of this field. Default Value: You can add default value for all the section of Display name field. Size: Lets you to limit the size of Display Name field. This field lets the user to input their email address. Field Label: This is the text that you will see on the form of the Email field. You can put any text here that helps to understand the use of this field. Default Value: You can add default value for all the section of Email field. This is the field of inputting a user’s date of birth. Field Label: This is the text that you will see on the form of the DOB field. You can put any text here that helps to understand the use of this field. Default Value: You can add default value for all the section of DOB field. This field enables the user to feed in their website address. Field Label: This is the text that you will see on the form of the Website field. You can put any text here that helps to understand the use of this field. 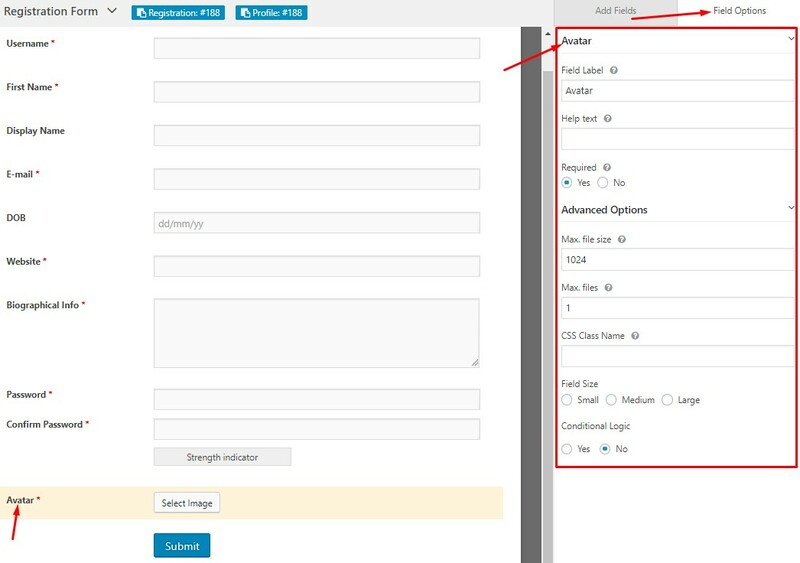 Default Value: You can add default value for all the section of Website field. 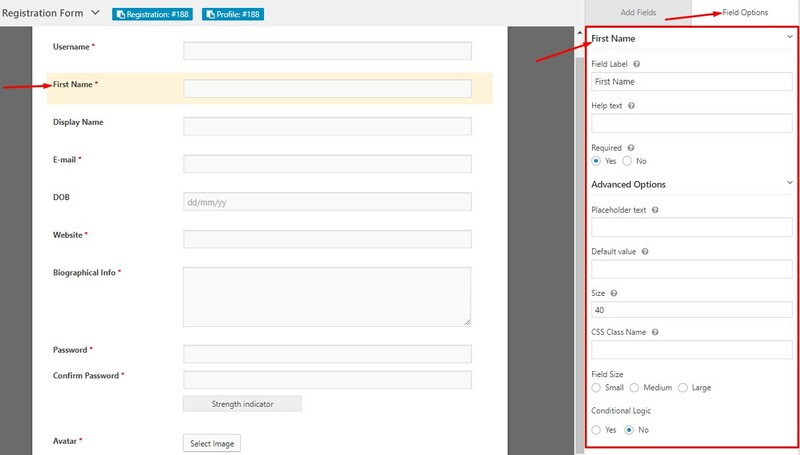 This user field element allows the user to write a brief bio describing their own self. Field Label: This is the text that you will see on the form of the Biographical Info field. You can put any text here that helps to understand the use of this field. Rows: Lets you limit the number the rows in Textarea. Columns: Lets you to set the number of columns in Textarea. 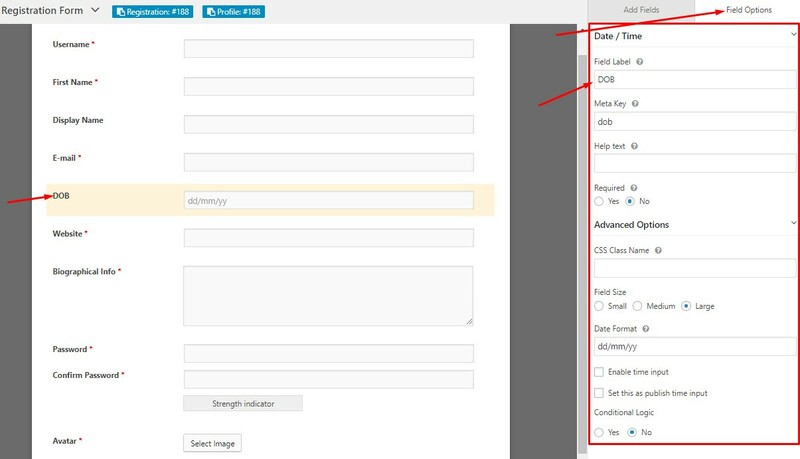 Default Value: You can add default value for all the section of Biographical info field. Textarea: Lets you to select from three types of Textarea: Normal, Rich textarea & Teeny Rich textarea. Word Restriction: Restricts the number of words for the user in the field. This field is used for inputting the login password of your ID and to confirm that password. Field Label: This is the text that you will see on the form of the Password/Confirm Password field. You can put any text here that helps to understand the use of this field. Minimum Password length: Limits the character of password length for the user. Re-type password label: This lets you to change the label of Re-type password. Password Strength meter: Selecting this indicator lets you to determine the strength of your chosen password. Field Label: This is the text that you will see on the form of the Avatar field. You can put any text here that helps to understand the use of this field. Max. file Size: This limits the maximum size limit of your uploaded file/image in KB. Max files: This restricts the number of file/images to be uploaded.